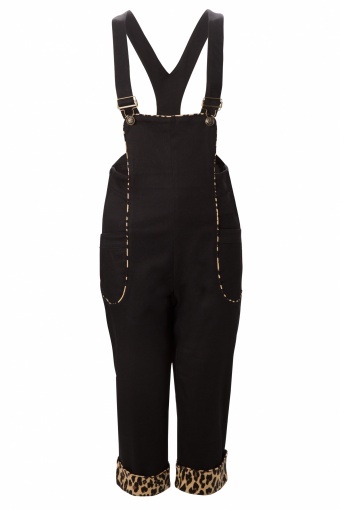 Frieda Leopard Dungaree from Collectif. Playful pinup version of the 'utilitywear' work suits from the 50's! Made of a stretchy black denim in 3/4. 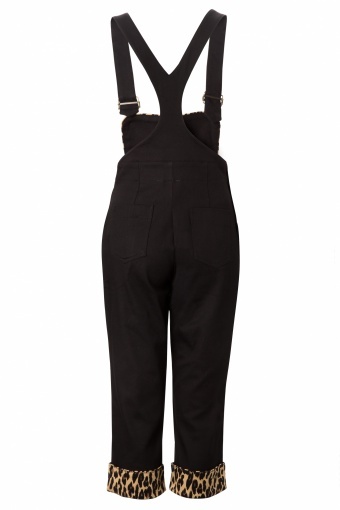 Fitted high waist with side zipper, frontpockets and 2 pockets on the backs. This is not a pencil style leg, but more straight boot cut leg. Finished with flattering leopard pipings and leopard print lapel (not fixed, so you can wear them unfolded, the inside is black). The last picture we placed to give you a view of the backside, the red style is not available!